Normally i Play Bluesrock through a Vox Ac30 with some Pedals. Now I'm Working on a new Stoner project so, i need a new Amp. I read that the AD30 is Basically a Heavier Ac30? I think the TH30 is too modern. Which amp Suit the best? They all vary a bit on what they do but you can maybe get a feel from videos of what each one does well. Here in Germany i only can get the OD50 used so i cant test ist. The TH30/50 is too modern for me and have too much gain. I see a lot bands with the Rockerverb 50,but it is modern like the TH? And the AD30.. Its the Amp I'm interessted the most. But how i Compare to a Vox ac30 which i have? On the Orange and in many reviews its described like a Ac30 with more grit and balls... But does it to the Stoner think? The ac30 has not enough balls. How the AD30 deals with fuzz pedals? Don't confuse the TH30 and the TV50 - they are very different, and the TV50 is well suited to stoner rock. The AD30 is a good choice too, as would be the OR50..... or the Rocker 30. Again, the R30 shouldnt be confused with the RV50, they are very different amps (I own both, the R30 begs you to play big fat heavy stoner riffs). The OR100 would be great too. Yeah, the TH30 is a very solid amp (I own one) but I am going to go out on a limb and say it isn’t for you. The TV50 like ant said is a very different beast. The RV series is “modern” but it is quite flexible in its uses. I am not much a stoner player so I can’t say for certain what characteristics would or wouldn’t appeal. Tim Sultan from Clutch uses Orange Or 50 and other OR models and Tiny Terrors ...so any none modern voiced Orange will get you close , the Ad30 certainly will. The Orange Ad30 is nothing like the Vox Ac30 similar in name only. Thanks guys you helped me alot!! Can someone Explain me the Channels from the TH50? Channel B is more Modern sounding an have more gain than Channel A? The Thunderverb 50 is what I was going to mention. Having used a CR120 and OR15, both of which have 4 stages of gain, I can say both are great but for that 'traditional' stoner vibe like Sleep, Kyuss, and Electric Wizard a TV50 is superb. It has 3 stages so a boost is needed to bump it up into insane gain levels, which is what a lot of the vintage gear stoner groups use requires. After playing a TV50 I'm kind of sold on lower gain amps for metal. That said, I bought the TV50 because Michael Gira from Swans uses one, albeit the 200 watt version. I like versatility in an amp and the TV50 has loads to spare. Scott Kelly from Neurosis also uses a TV200. You did mention Red Fang however. They are more known for using solid state amps and one of the guys has praised the CR120. It's a great amp, as is the OR15. All three take fuzz pedals great. I know an increasing number of stoner bands using cr120s. It also depends on the kind of stoner rock you are doing, cab setup, and what gear your band mates will be using. Maybe some song references would be helpful for your stylistic ideas? 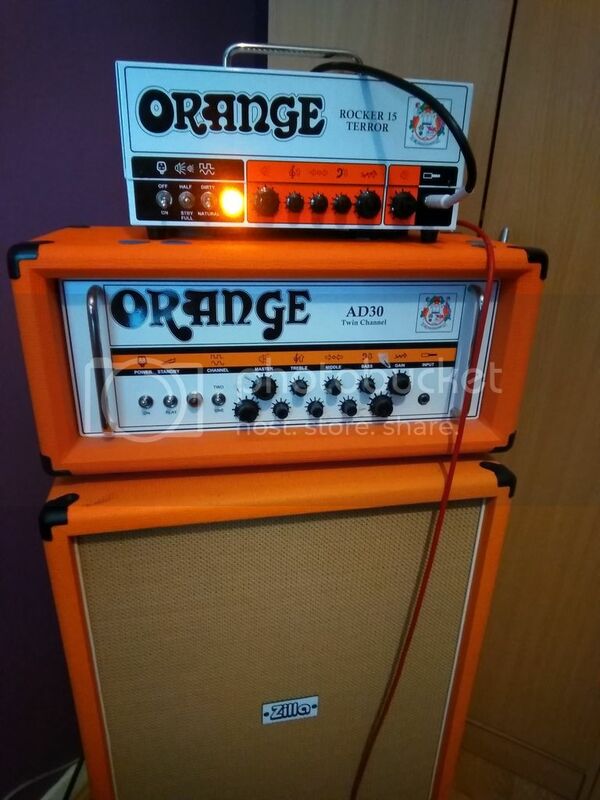 I have used my AD30 for stoner rock aka QOTSA, or riffy type stuff as the only guitar player in a band quite happily but higher wattage orange amps do have more low end to work with. I would say it my OR50 is more suited for heavier music vs AD30. I've seen 1000 mods live and they were using rockerverbs and sounded fantastic. I don't agree with AD30 sounding like ac30. Orange sounds thicker, fuzzyish to me. Vox sounds more trebley, chimey etc. Yes! I can talk stoner rock all day so song references would be great. I've heard the CR120 is comparable to the Sunn Beta Lead that Red Fang loves. I've never played one so I can't say whether it is or not. Definitely the price is a big factor in choosing the CR120 over a Sunn. Some bands I've been getting into are The Devil and the Almighty Blues and Satan's Satyrs. Both must use vintage equipment from how their recordings sound. Thats why I like the TV50. Retro sounding enough with a modern edge, but not just a heavy metal amp. That's an article with a guy from red fang talking about his orange gear. I haven't tried a cr120 yet but I'd like to. Datab is a cool band, I have their first album. I like using fuzz pedals with my AD30, I've used a fuzz factory for lead sounds, catalinbread octapussy for lead or rhythm stuff and they sounded cool with a band. Pharaoh fuzz and carcosa (with a strat) kinda disappeared but I didn't really try to make them work as I like the amp sound a lot as is. The modern Oranges are good amps, just different than the vintage ones. Not necessarily better or worse, just different. Both channels have loads of gain, this amp is not modern tone at all, channel B is thicker that's the difference. I actually have my B channel setup as my clean channel since dialing the gain back thins the tone down, channel A is my gain channel since it has the full EQ to tweak my tone more. I have a friend who is a stoner musician and he cranked my amp to stage volume last month which I never do and it sounded glorious!